Ski in - ski out, the chalet Dali is located in a private domain, a few minutes away from the village of Megève and the 18-hole golf course of Mont d'Arbois. 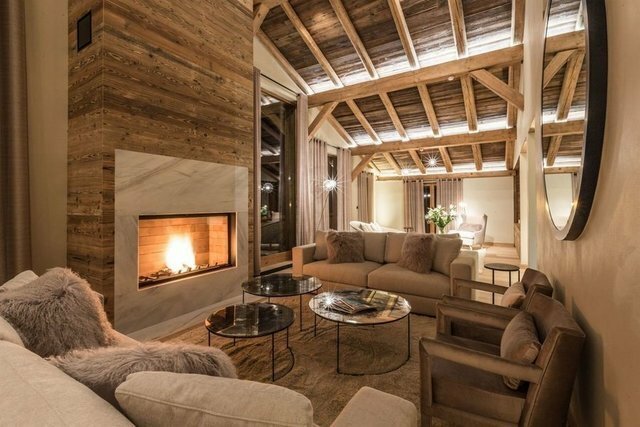 This luxury chalet subtly marries the traditional architecture of our mountains, made of authentic materials, and the elegant and neat decoration thought in a contemporary spirit. This luxury chalet Dali of about 420 sqm is composed of four large double bedrooms with en-suite bathrooms, a master bedroom and a dormitory with bunk beds for children. The elevator allows easy access to all living areas, large and warm; they include several living and reception rooms and lounges as comfortable as cozy. The large bay-windows flood the living rooms and dining rooms with this natural light so dear to our mountains. The terrace and the garden allow to take full advantage of the breathtaking views of the surrounding peaks that is offered to you. The highlights of this luxury chalet: - ski in / ski out, quiet location, close by Megève, - the breathtaking views of the surrounding peaks and the natural light that flows through the large bay windows, - 6 en suite bedrooms including 1 dormitory for children, - the numerous living spaces designed to create as many places of conviviality as small shelters where to rest, - parking, terrace and garden to fully enjoy the place. Propriété de Megève Sotheby's International Realty, expert in the sale of luxury chalets in Megève.